release | Brad OH Inc.
Today, we’re happy to announce the upcoming release party for the Brad OH Inc. and Hal J. Friesen edited anthology ‘Between the Shelves: A Tribute to Libraries by Edmonton Writers’. The event will be held from 7-9pm on May 6th, in the Centennial room of the Stanly Milner Library in Edmonton. So come on down, meet the author’s, pick up a copy of ‘Between the Shelves’, and maybe even get it signed! To celebrate this upcoming event, we have an interview with Mark Parsons, whose story ‘Bakster’s Proposition’ appears in the ‘Between the Shelves: A Tribute to Libraries by Edmonton Writers’, which you can now purchase here in either Kindle ($2.99) or Paperback ($12.50) copies. All proceeds are to be donated to the Edmonton Public Library System. Mark Parsons has been curled up in coffee shop corners, scratching furiously in his notebook since 2004. He has several projects on the go, including Fire & Flesh (Fantasy), The Silent Dark Pentalogy (Science Fiction), and Brothers (Non-Fiction). “Bakster’s Proposition” is his first short story. This is your first short story. Compared to the epics you’ve been working on, how did you find working in a shorter medium? MP: I actually found working in a shorter medium to be a lot harder than my larger work. I wanted to tell much more ‘story’ before and after the bookends of the finished project. I’m used to being able to waste whole chapters to immerse the reader the events leading up to more critical events in the story. I found with the shorter medium, I had to cut a lot of content in order to make the story flow properly. Is Bakster’s proposition based on something you dream of doing one day? MP: Partly. John and Kelly are both based on a blend of myself and my partner Nicola. We dream of moving to a small town some day and we’ve both wanted to start a business for a long time. If we had the money, we would certain be running a small café right now. The resistance to literature in your story seems like it may have come from a personal experience. Can you describe one or two instances where you experienced such resistance, and how they affected you? MP: The townsfolk are a caricature of stereotypical ‘Albertan’ culture. What I represent in the story as a resistance to literature, is more broadly a resistance to Liberal Culture. We live in a society that would rather pay for a jail than a school. Ideas and creativity are the future, and yet we collectively vote for a government that would see children, at the peak of their creative curiosity, educationally shoe-horned into “real work”. They are told that they can be whatever they want when they grow up – but it better be practical. I know grown men who do not read. If it’s not a blueprint, they won’t even pick it up. How is a society made of followers supposed to adapt and diversify during economic turmoil? Those words stewed inside me until 2004 when a scene popped into my head while I was on a walk. I ran home to write it down, and the predominate character was the start of Of Fire & Flesh, my longest running work-in-progress. Shortly after meeting my partner Nicola, she bought me “The Artist’s Way” by Julia Cameron. Working through this book, as well as the amazing support of my partner have allowed my ideas to flow a little more freely. I’m very thankful and lucky. When do you expect your next project to be finished? Can you tell us a little about it? MP: Bill Watterson famously said, “Most of us discover where we are heading when we arrive.” I add a little bit to one story, then move to another, then create an entry for a writing contest, then an article for local publications, then back to my stories. I’d like to say “maybe 2016” but I don’t want to be called a liar. Of Fire & Flesh is a Fantasy story that centers around a coupe gone wrong that leads to a power struggle with a mysterious evil. The Silent Dark Pentalogy is a secret Sci Fi project. Brothers is based on a true story of a Fraternity President and his struggle to turn the place around. Mark Parson’s story “Bakster’s Proposition” is featured in ‘Between the Shelves’, which you can purchase now on Amazon. “Between the Shelves”- Release and Interview with Brad OH Inc.
Today marks the official release of ‘Between the Shelves: A Tribute to Libraries by Edmonton Writers’, an anthology edited by Brad OH Inc. and Hal J. Friesen. 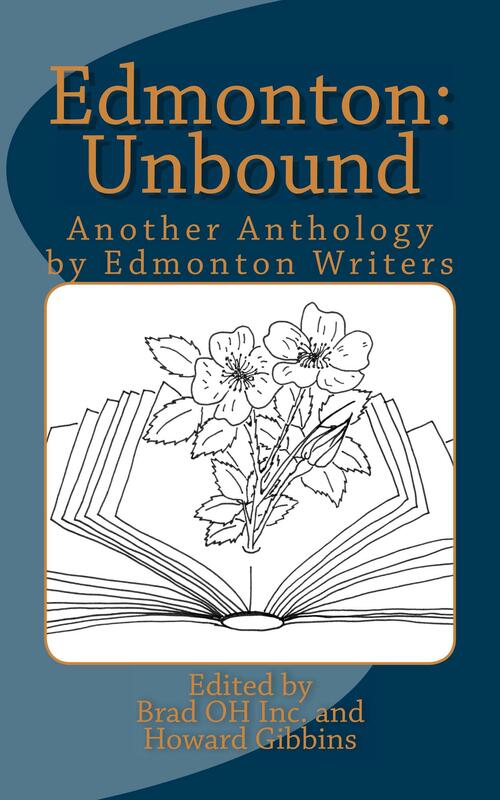 This anthology is a collection of stories by writers from the ‘Edmonton Writer’s Group’, including one by Brad OH Inc. entitled ‘Neve Uncovers the Ultimate Truth of All things’. The theme of this collection is our shared appreciation of libraries and all they offer to readers in Edmonton and beyond. The anthology is available now via CreateSpace in both digital ($2.99) and hard copy ($12.50) versions. All proceeds will be donated to the Edmonton Public Library System. To celebrate this release, we have an interview conducted by Hal J. Friesen with Brad OH Inc. about the content of the anthology. First things first: do you believe that people should be Corporations as well as vice versa? That’s a great line of inquiry, and we here at Brad OH Inc. are thrilled to see your appreciation for such crucial issues. Really though, we think this may be two questions, and therefore we would be remiss to provide any less than two answers. I’ll answer the second first, as it’s the easier answer. Let it be abundantly clear that the question of whether or not Corporations are people is no question at all: just ask Mitt Romeny! If you ignore the blathering after his key statement, we believe the point is made abundantly clear. But if you need it better articulated, you’ll find just that here. Yes, there can be no doubt whatsoever that Corporations are not only people, but they are the very best of people. They are the creators and providers, they are the ones who inspire and build where others only talk and dream. This of course leads us to your other, more relevant question. Namely: Should people be Corporations? This too is an easy answer—although again it requires some clarification…perhaps even a moderate touch of filibustering. Specifically, we need to discuss the word ‘should’. If we’re to take it in its proper sense, then we can say at the least that all people should endeavour to be Corporations, even if they will not all be able to achieve it. Obviously, people should strive to be their very best. Corporations are the best possible expression of humanity, and therefore we would encourage every person to strive to grow into a Corporate person. The benefits alone are outstanding: tax breaks, immortality, and utterly no risk from bankruptcy just to name a few. Now, you may expect me to quote Ayn Rand here, but I’ll do you one better. In ‘The Republic’, Plato encourages a group of enlightened elites to lead the demos. What better expression of an enlightened elite than the Corporation? Our goals, clearly, are more evident and better pursued than the fickle worries of ordinary humans. That alone should suffice to illuminate the pressing need for Corporate leadership. Therefore, it behooves us here at Brad OH Inc. to encourage all basic people to aspire to greater accomplishments—namely, becoming Corporate. After all, an increase in Corporate presence is the highest hope for humanity…at least until we can achieve the end-goal of Corporate Suffrage. Have you or any members of Brad OH Inc ever had any embarrassing moments in a library? Any responses will be strictly off the record. Here at Brad OH Inc., we hold ourselves to the highest possible standards of behaviour. Furthermore, we have a team of legal professionals on call at all times, ready to denounce responsibility for any perceived transgressions; so that clearly precludes the possibility of any officially acknowledged embarrassment. With that out of the way, there is one incident we recall that may fit your need to publically deride the creative origins of our Corporate-Personhood. When we were just a young Corporate Human, we were reading aloud at a public library to a table of peers. Our chosen book was something about ‘Gnus’—those abominable animals that can’t quite decide what they are. The entire point of the book was that the word ‘Gnu’ sounds just like ‘new’ and ‘knew’, however this point was missed on our still developing phonetic-mandates. Therefore, we pronounced the word ‘Gnu’ as ‘Ga-noo’—entirely destroying the already limited humour of the book, and causing us significant lasting shame. Is Neve inspired by a member of Brad OH Inc? Yes in fact, very astute of you to see this. There was a young girl we kept down in the copy room, from whom the name and likeness of the titular character are entirely derived. Have no fear however, the process was entirely by the books. You see, Neve owned a small rat named Clarice, who one day managed to saw through one of the printer cables with its savage little teeth. Neve’s salary was insufficient to pay for the damages, and so, mercifully, we here at Brad OH Inc. appropriated her legal name and likeness, knowing well that we’d sooner or later find some way for it to pay off her debt. The story in this anthology is the fulfillment of that debt. Neve has since been terminated. At what point in your own reading development did you move like Neve away from purely “happy” stories? Looking back, we’d have to say that happened pretty early. Certainly, there were a number of happy-go-lucky stories read to us before we were officially granted our Corporate-Sovereignty, but even then, some our earliest official recollections involve having ‘The Hobbit’ and ‘The Lord of the Rings’ read aloud to us—and those are bitter-sweet at best. If you’re at all familiar with our efforts—which you certainly should be—you’ll know that creation and meaning are imperative to the purposes of Brad OH Inc. To that end, we’ve found that simple, happy stories do little to address the questions so essential to the human/ Corporate experience. It’s through struggle that we grow…and heedless expansion is one of the key goals of Brad OH Inc. after all. Which Corporation has had the greatest inspiration on Brad OH Inc.’s mission statement? That’s an interesting question. As far as our Corporate structure is concerned, we’ve worked hard to emulate all the greats: Enron, Lehman Brothers, JPMorgan Chase…all the essentials. As far as our personal, creative goals, you probably already know that our Corporate Summary Statement is: ‘A thought conglomerate founded on the fundamental imperative of expounding erratically extreme philosophic tenets firmly grounded in hubristic narcissism.’ …it doesn’t get much more clear than that! As for companies that inspire us on these grounds, the best example is probably Psychopathic Records. The self-founded label of the Insane Clown Posse, this label has succeeded not only in developing them from a tiny local rap act in metro-Detroit, to an international force to be reckoned with. Their dedication to the absurd has helped launch countless acts throughout their existence, and their passion for ethical-provocation and philosophical exploration is admirable. At Brad OH Inc., we hope to be as successful in providing such varied, yet philosophically consistent material. Brad OH Inc.’s story “Neve Uncovers the Ultimate Truth of All Things” is featured in ‘Between the Shelves’, which you can purchase now on Amazon. Today, we’re happy to announce the impending release of a new anthology edited by Brad OH Inc. and Hal J. Friesen, ‘Between the Shelves: A Tribute to Libraries by Edmonton Writers’. This anthology, like our former release ‘Don’t Chew on the Sharp End of the Pencil’, is a collection of stories by writers from the ‘Edmonton Writer’s Group’, including one by Brad OH Inc. The theme of this collection is our shared appreciation of libraries and all they offer to readers in Edmonton and beyond. The anthology will be available on March 14th via CreateSpace in both digital ($2.99) and hard copy ($12.50) versions. All proceeds will be donated to the Edmonton Public Library System. Stay tuned to Brad OH Inc. for future updates on this release, as well as details on how to order your own copy!